In this article, I’m going to show you how you can make some easy side money through online arbitrage. If you’re not familiar with what arbitrage is — which I’m sure most are, but regardless — it’s essentially profiting off a difference in prices across two or more markets. In an online space, arbitrage is quite attractive to people who want to make money online because there’s a low barrier to entry (practically anyone can do it), it doesn’t require any specialized knowledge, and depending on how you approach it, there is little to no risk involved. For those who are lazy and don’t want to read the entire article, this method can be summarized as follows: find products on AliExpress that are selling successfully at a higher price on eBay, list these products on eBay at a markup and dropship them from AliExpress directly to your eBay customers. For this application, we’re going to take advantage of two sites: AliExpress and eBay. I’m sure you’re aware of the e-commerce giant eBay, but you may not be familiar with AliExpress. AliExpress is an online retail service where you can get good quality product at very low prices from Chinese suppliers. They have a massive selection of products including all types of clothing, electronics accessories, jewelry, furniture, home products and much more. While many of these products are losers in terms of pricing, many of them are actually priced low enough that you can sell them on eBay at a markup. You can look at “flash deal” items (as pictured) for items that have a better chance of selling at a higher price, but the problem with this is that once these deals end, you’ll have to adjust your pricing or remove these listings entirely from eBay to maintain your margins. Often times you won’t even get a sale before the deal ends. 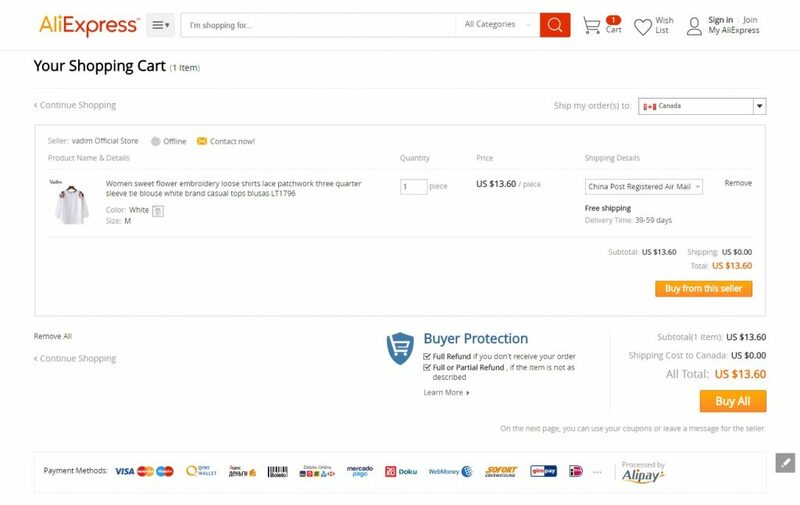 You’ll be able to source many AliExpress items at even lower prices if you purchase them in bulk and store them yourself. The obvious downside to this is the substantial risk and extra headache associated with storing, packing and shipping everything yourself. In my opinion, as long as you can make the margins you want dropshipping, there’s really no reason to stock this product beforehand. Do not forget to take into account shipping costs (usually very cheap) as well as eBay and PayPal fees when evaluating the viability of products. eBay takes a cut of 10% of the final sale amount (up to a maximum of $750) and PayPal adds on a couple more percentage points. Both branded and unbranded (or branded but doesn’t feature the brand name on the actual item) products should both be considered. You can often list products that don’t have the brand name featured on the actual item for a lower price than similar products under a well-known brand; this will usually get you more sales since eBay is widely known as a place to get good deals. On the other hand, with items under a well-known brand, you can quickly determine whether or not you can price competitively on eBay. Next you’re going to list the product on eBay at around a 10% markup after deducting eBay/PayPal fees and adding any potential shipping costs to the cost. This means that you’d make a profit of around 10% of the cost of goods sold (source cost + shipping cost) after deducting eBay and PayPal fees. Note that this method will work just fine with whatever geographical eBay site you use, as long as the supplier can ship there. Together, eBay and PayPal fees amount to about 13% of the final sale price, and so the listing price that achieves the 10% margin would be approximately cost*1.26. In general, the minimum price you want to list items at to achieve at least your desired margin is cost*((1+margin percentage)/0.87). 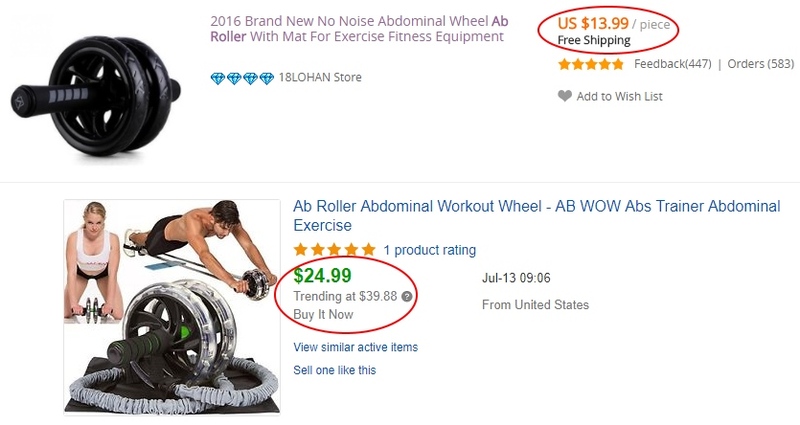 In the above example, you would want to list the ab roller at a minimum of $17.71. Once you’ve listed the product, move on to the next one. Repeat the process until you have many products listed. Remember that the more products you have listed, the more money you stand to make. Also be aware that your monthly selling limits, which will increase with time, will set a cap on the number of items you can list. All that remains now is to dropship orders to your eBay customers. 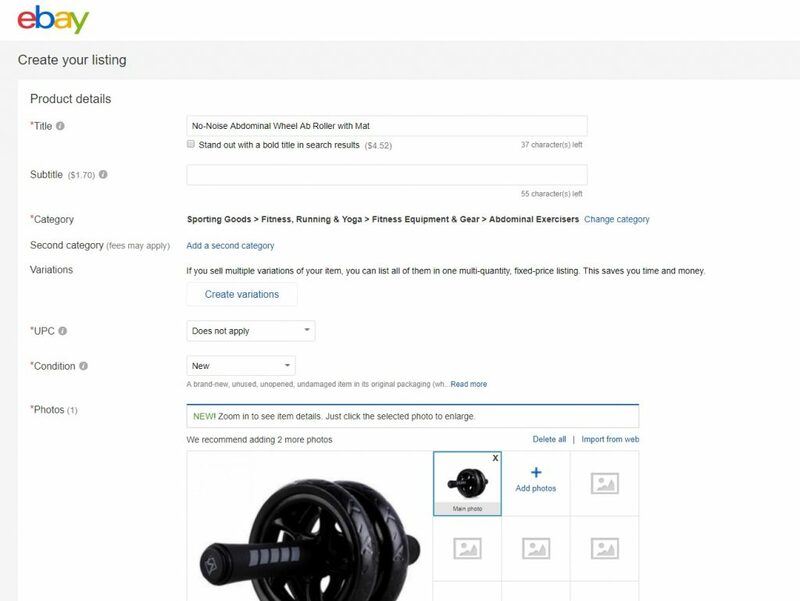 When you make a sale, order the product on AliExpress and put the customer’s shipping address (displayed in eBay) in as the “ship to” address. As I mentioned above, the item will likely take at least a couple of weeks to reach the customer. 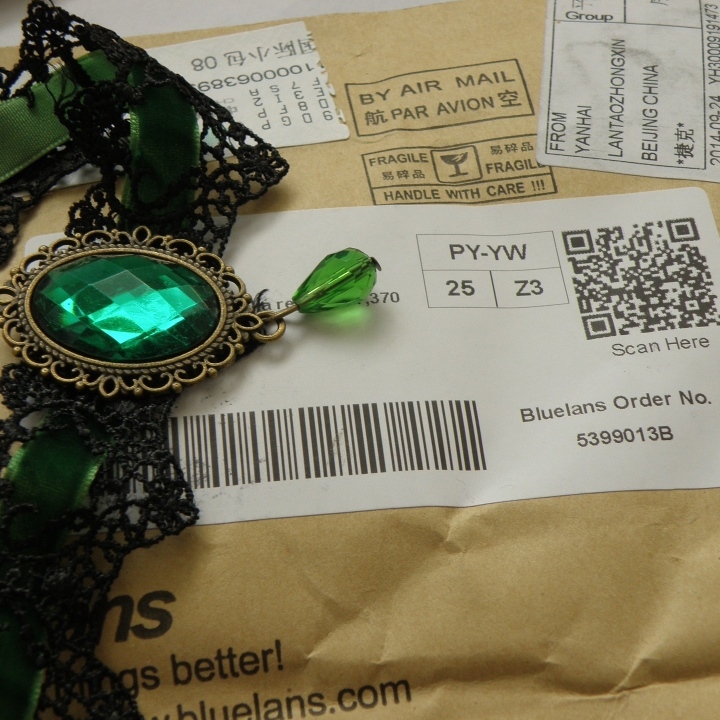 It would probably be a good idea to ask your AliExpress seller not to include a packing slip or store information in the package they ship out. After all, you don’t want to make it obvious that the product is being sourced from China, do you? Returns: You should also continually be monitoring your contact points, like your eBay message center, for messages from customers with concerns or return requests. I recommend offering returns on as many items you can and honoring any return requests that come your way. If the item in question is less than $20 or so, I would think about having it sent to you instead of the sourcer and taking the loss; the reason is that it won’t look the greatest if you’re giving a customer a return address that’s based in China. For higher ticket items, however, you should definitely follow the return process of your AliExpress vendor. That about wraps up my overview of this arbitrage method. This is not a new method, but it’s a powerful one that still works to this day. There are a lot of people out there are making amazing money with this right now. As for me, this is something that I’ve dabbled in in the past and had some success with before I moved on to other things. In a matter of a few hours and with no initial investment, you can have a bunch of winning products listed on eBay that are bringing in extra cash for you on a regular basis. As with anything else, it will be up to you to take action and overcome the obstacles that might come your way. Let me know how you do! If you have any questions or feedback on this article, feel free to leave a comment below! Prev InstaCode Review + Bonus – The Real Path To Money Online? Hi, Paul, have tried automated software like https://salefreaks.com/ or any other? I want to try but dont know is it good or even work. What do you think?